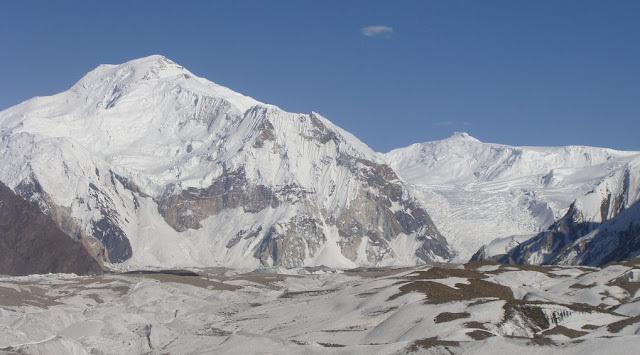 K-2, the second highest mountain after Everest and the highest mountain of the Karakoram range located in Pakistan, was first surveyed in 1856 by a European survey team headed by Henry Haversham Godwin-Austen and was named as Mt Godwin Austen. Later a British officer T.G. 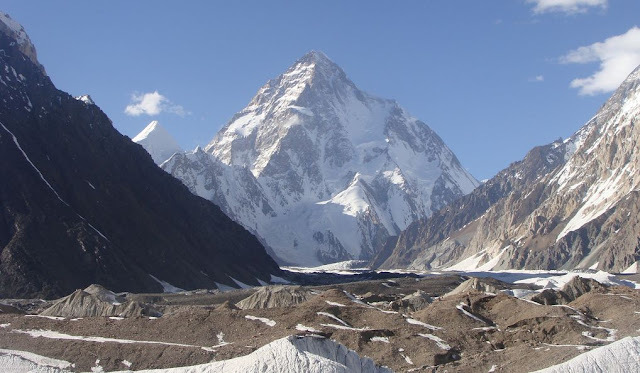 Montgomery designated it K2 for the second peak in the Karakoram Range. It was first scaled in 1954 by an Italian expedition. 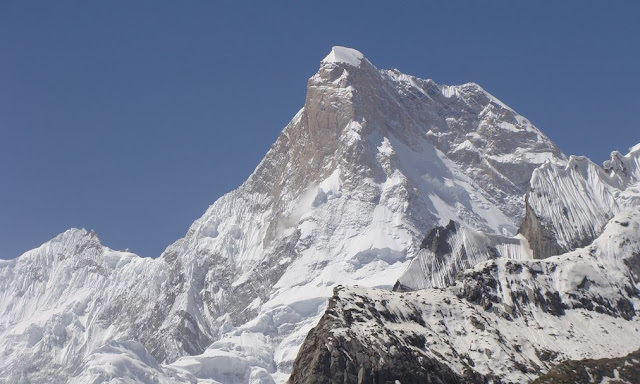 Due to its difficult slopes, K-2, 8611 M, is far more difficult to scale than the Everest. 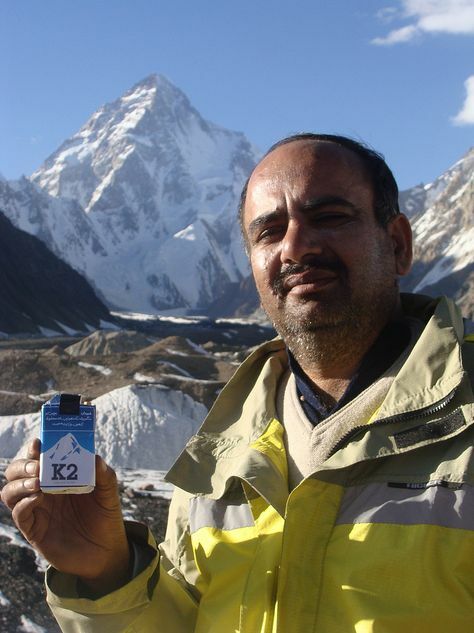 It is for this reason K-2 is also known as the killer mountain as many mountaineers have lost their lives in attempting K-2. 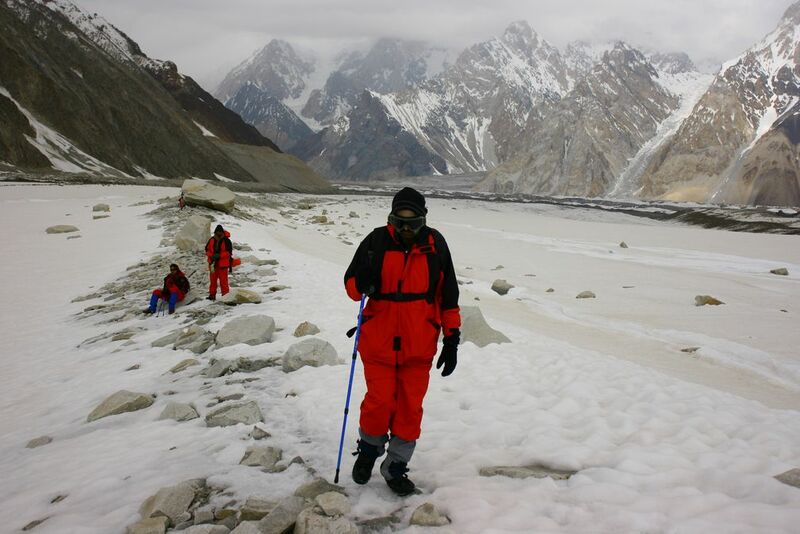 While professional mountaineers begin their upward journey from the base camp of K-2, located about three hours hike from Concordia - a place on the confluence of the Baltoro Glacier and the Godwin-Austen Glacier, in the heart of the Karakoram range of Pakistan, trekkers normally stop at Concordia from where the massive pyramid of K-2 is fully visible, cherish the memories of the place and come back. 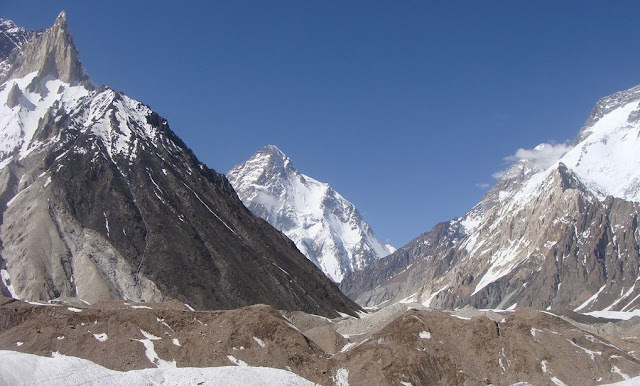 Concordia also provides an access to four Eight Thousanders located in Pakistan. 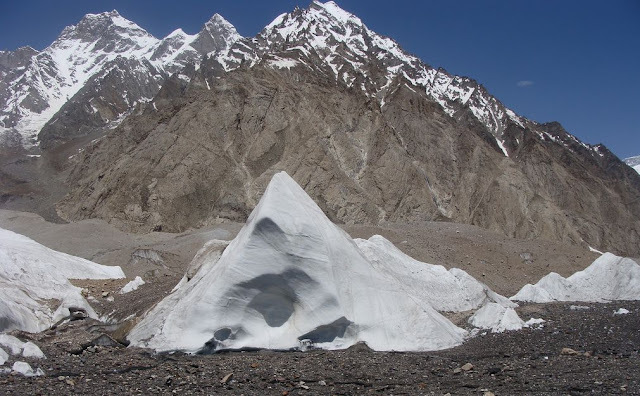 Every year, many trekkers both from Pakistan and abroad trek to Concordia and on their way back use the Vigne Glacier - Ali camp - Gondogoro la approach. This post is about one such trekking expedition to Concordia by group of young Pakistani trekkers that include my Flickr Friends Dr Shahid And Asif Saeed (whose many adventures I have already shared at Jaho Jalal). 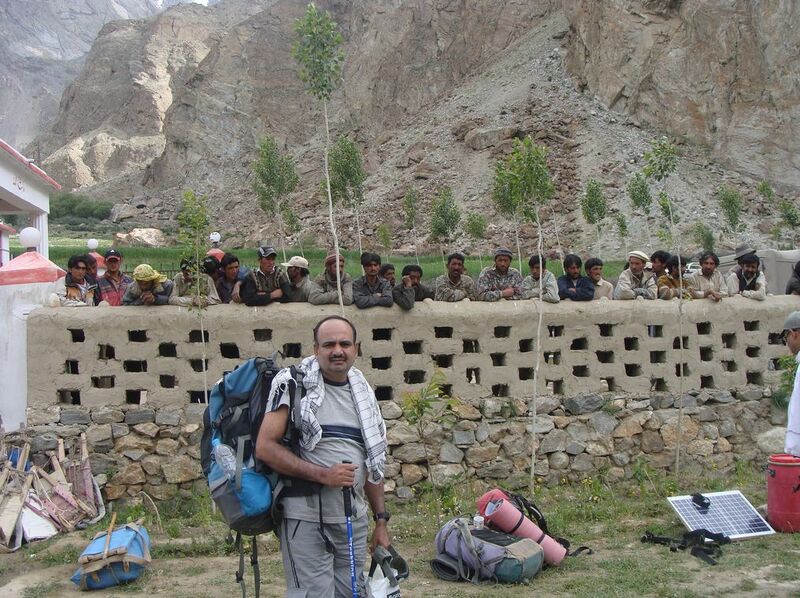 Dr Shahid, besides being a doctor is an avid trekker and photographer. 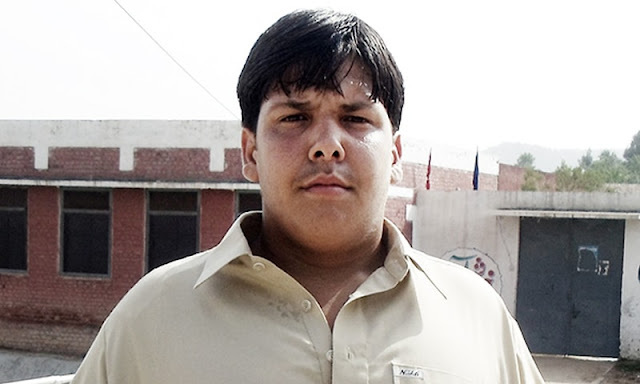 He hails Burewala, a city in the Vehari district of Southern Punjab province of Pakistan. 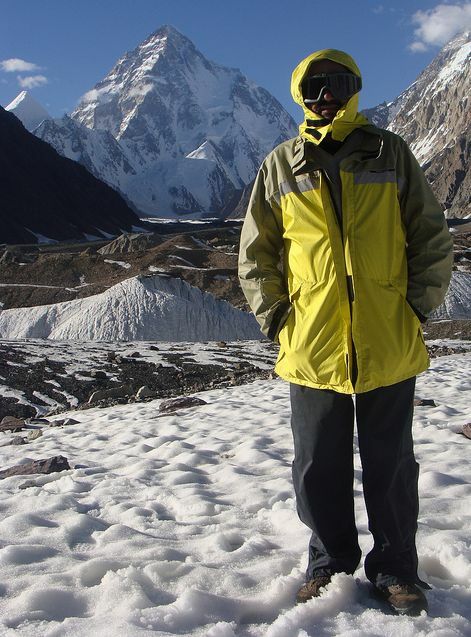 His passion for mountains and trekking takes him from otherwise generally hot plains of Punjab to freezing colds and snow capped mountains and glaciers of mountain ranges in the northern Pakistan. 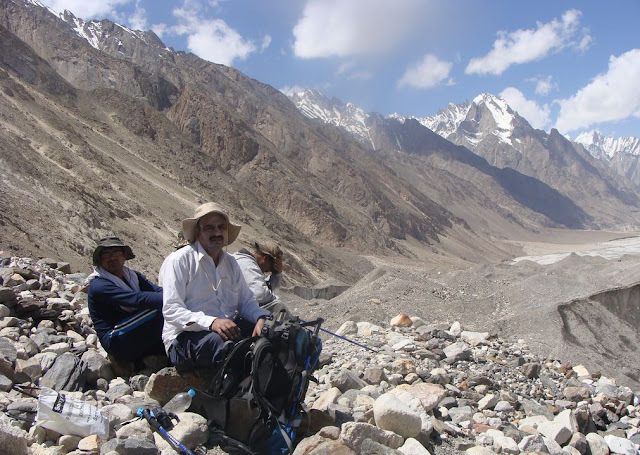 This post of mine today is about the trekking expedition of Dr Shahid and his friends including Asif Saeed, to Concordia - a place where one is so close to the nature and next to K-2. 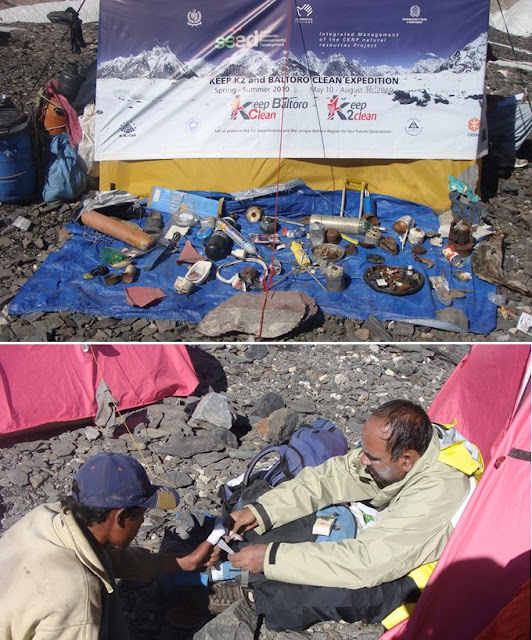 The expedition was undertaken in July 2012 and the the photographs below, taken by Dr Shahid are chronologically arranged from the begging to the end of the expedition to Concordia and beyond. I have used a few of his large collection of photos from Flickr and added a running commentary about the places that came en route. Since there are approximately fifty photographs, it may time for slow internet connections to open immediately. Therefore such users may scroll down slowly to enjoy the run down. 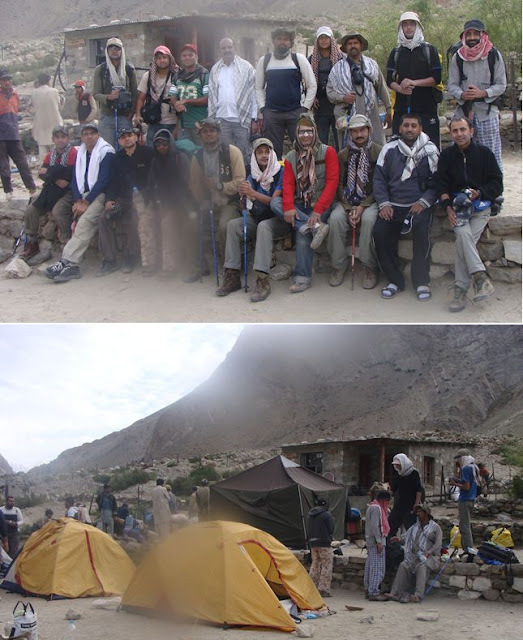 The group of young trekkers gets together at Rawalpindi Pir Wadhai bus stand to embark upon a journey that would take them through some of the most beautiful, awe inspiring and treacherous treks to Concordia - the famous base camp from experienced mountaineers commence another difficult journey to scale the unscalable K-2. 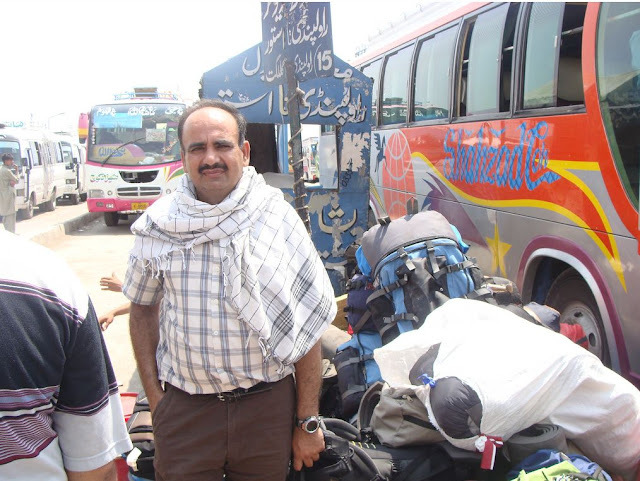 Here seen standing at the Rawalpindi Pir Wadhai bus stop is Dr Shahid to begin his trekking expedition to Concordia and Gondogoro la. 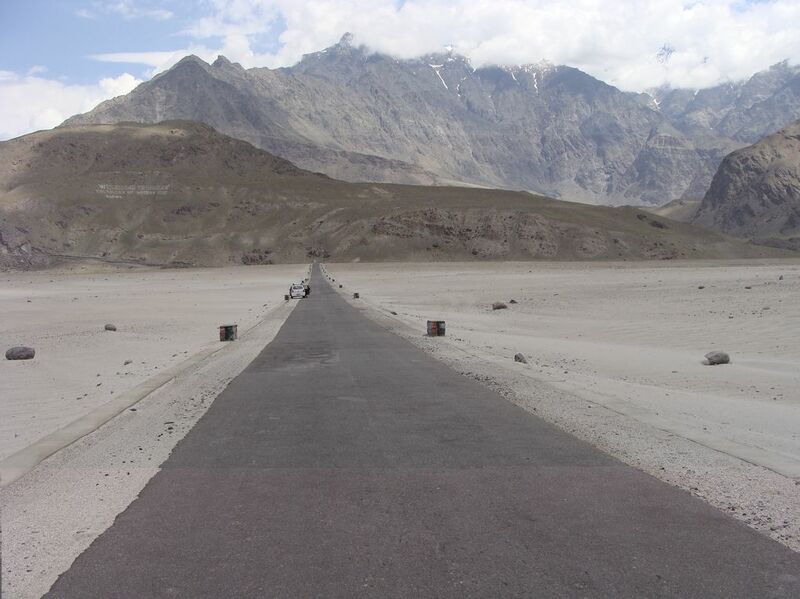 Once when one embarks upon trekking, then many stars hotels are replaced by roadside driver hotels. 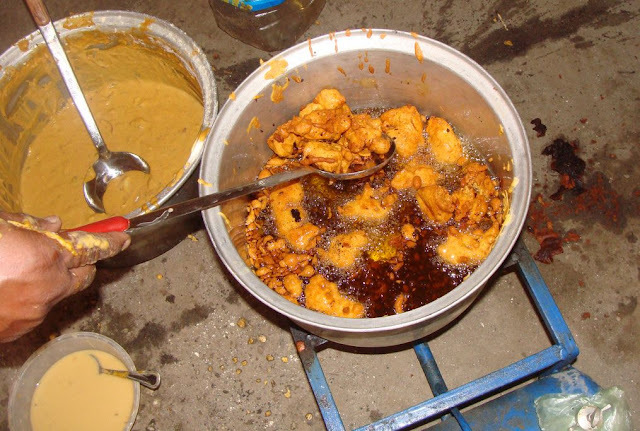 But the food served here is so delicious that one remembers the taste for a long time. 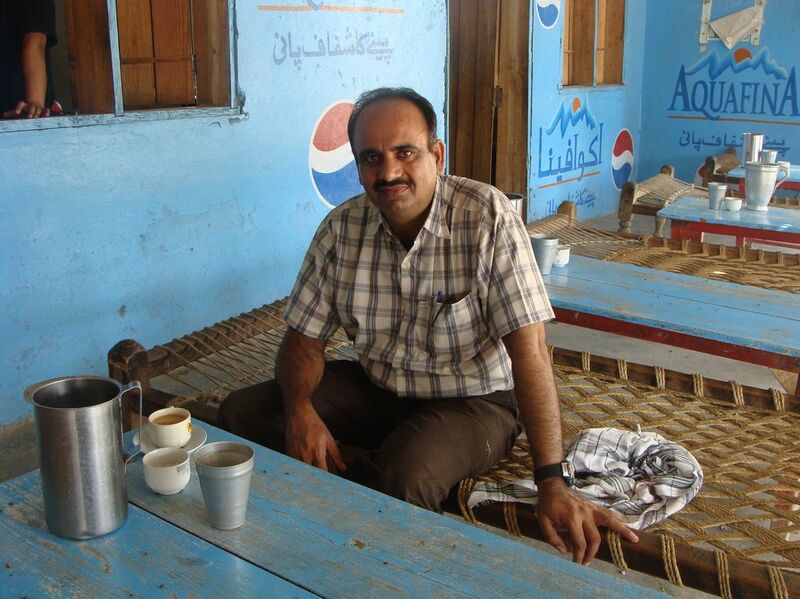 This shot was taken at one such at Mansehra, Khyber Pakhtunkhwa province. Dr Shahid has a cup of tea, made of Doodh Patti (that is Doodh - Milk and Patti - Tea Leaves and lot of sugar with no water). When this tea is made on burning wood, its aroma gets mixed into the tea and enhances its taste manifold - a cup of tea that has no parallel in the world. The bus travel from Islamabad is almost 24 hours long journey and the NATCO buses take the trekkers to Skardu - the last point where buses can reach. 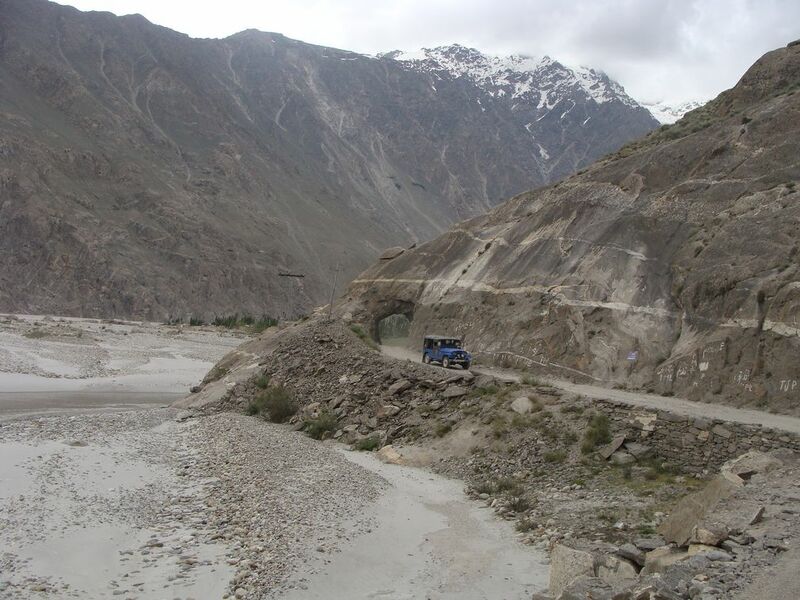 From here on, jeeps are hired till the village of Askole, which is the last road head. 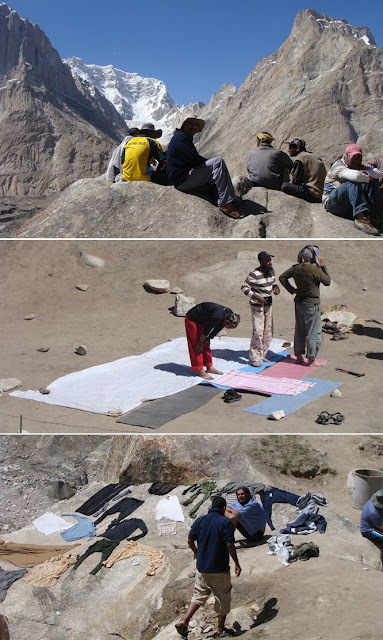 Thereafter its trekking - hard trekking to Concordia. 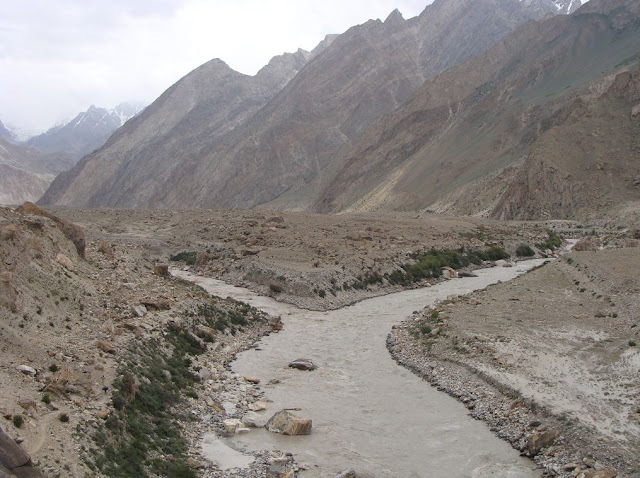 On the way, one passes through the small town of Shigar and the Shigar River, Braldu River, carrying gushing waters of the Biafo and the Baltoro Glaciers of the Karakoram through Sakora Pass. Reaching Askole from Skardu can sometimes be hazardous and challenging as rains may cause streams to swell making it difficult for jeeps to negotiate. 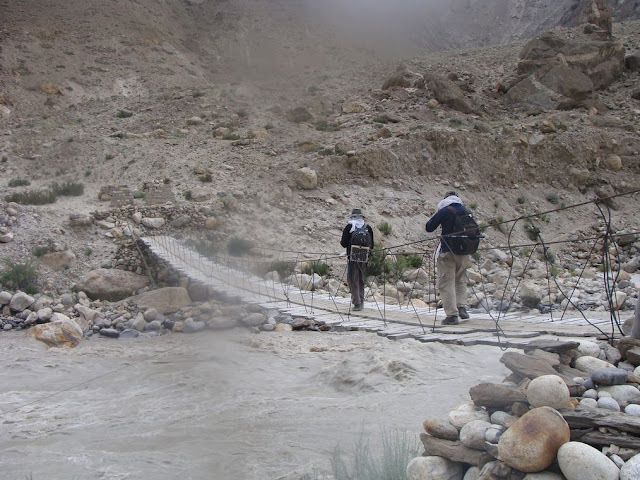 In that case one has to disembark from the jeeps and walk up to Askole - feeling the post Askole village trek before hand. 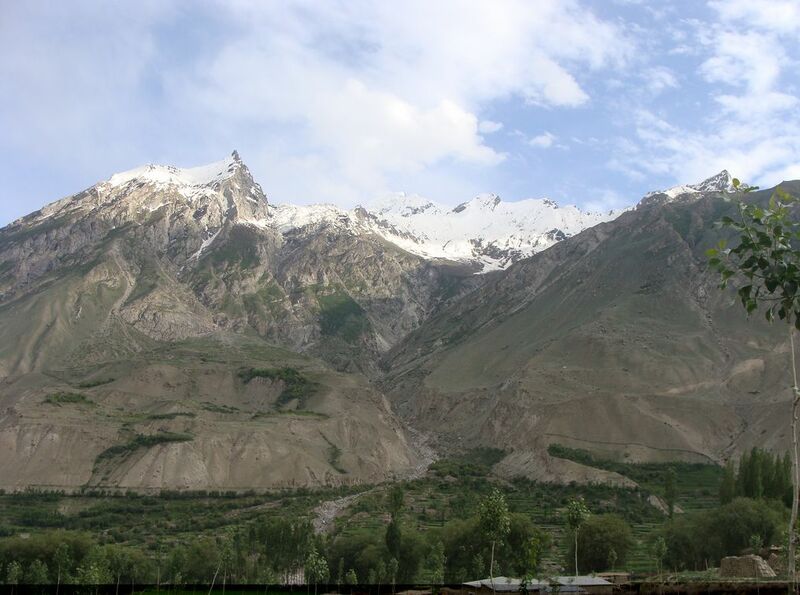 Askole Village is the gateway to Karakoram Mountain Range and its many glaciers, specially the Baltoro Glacier. Askole, located about 96 kilometers from Skardu, is Pakistan's highest, 3050 metres, and most remote village, the last human settlement before trek up to Baltoro Glacier to Concordia and highest peak and longest glaciers (outside polar region) on earth. Askole village is the starting point of the trek to Baltoro Glacier, Biafo Glacier, Chogtai Glacier. 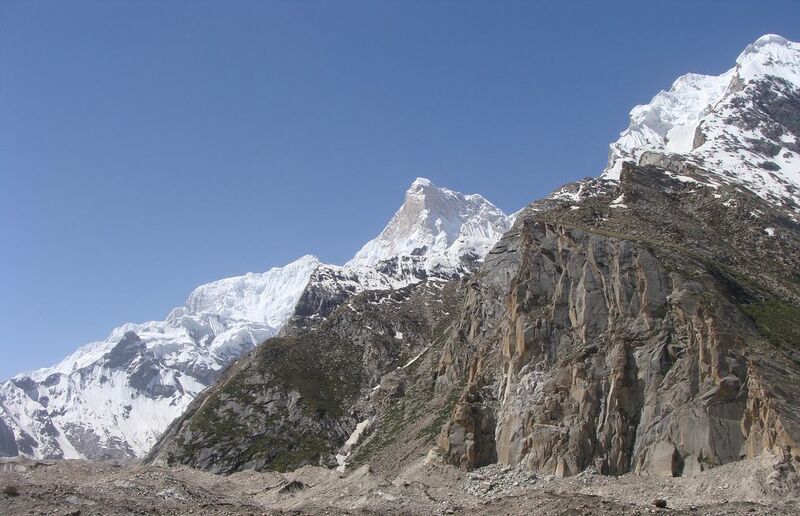 The Climbing and trekking expedition stay here for a night and arrange porters. 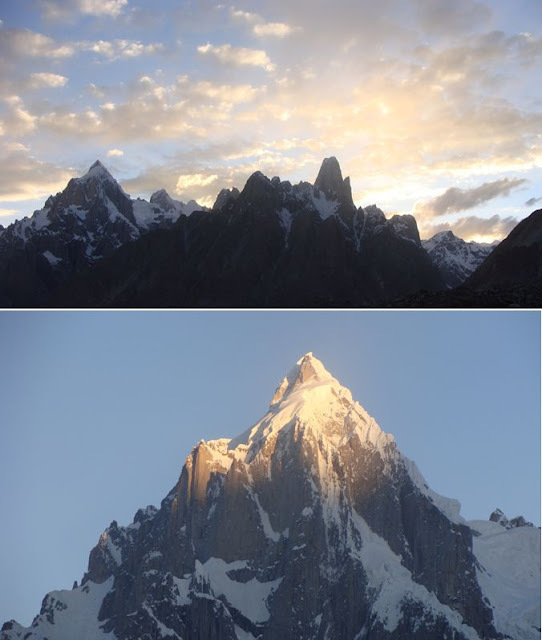 Askole village is gateway to K2, Broad Peak, Gasherbrums,Muztagh Towers, Uli Biaho Tower, Paiyu Peak, Baintha Brakk and Latok Peaks, and many more. 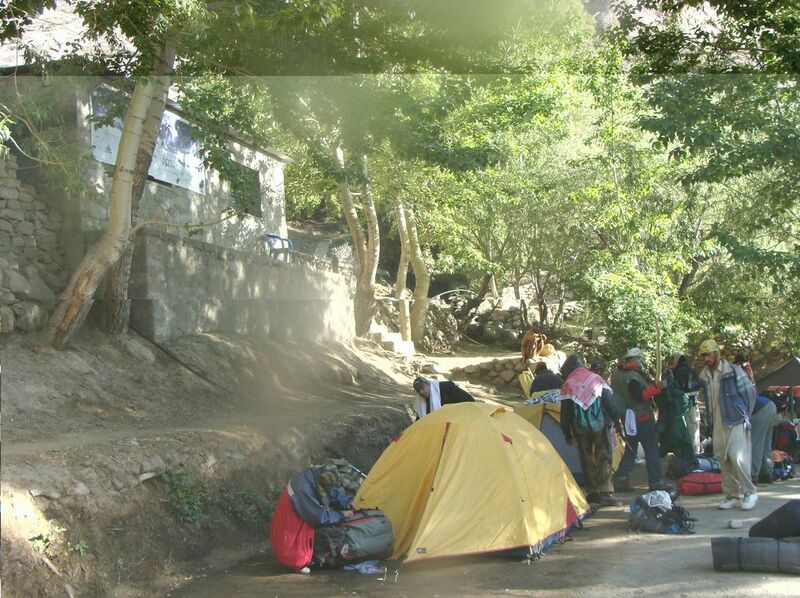 Camp site is available at Askole village. 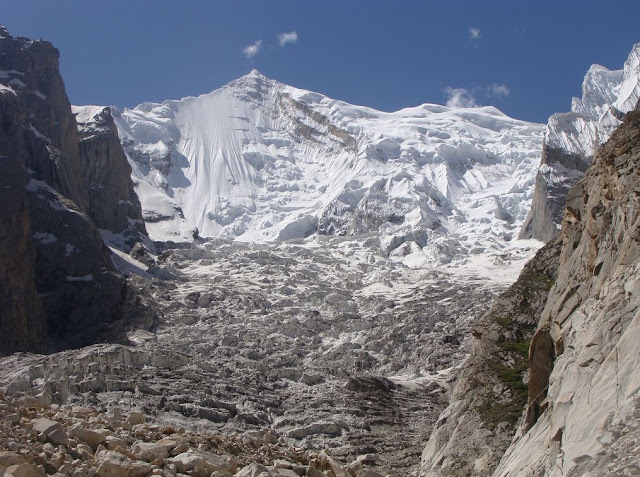 Gasherbrum I, 11th highest of the world at 8,080m. 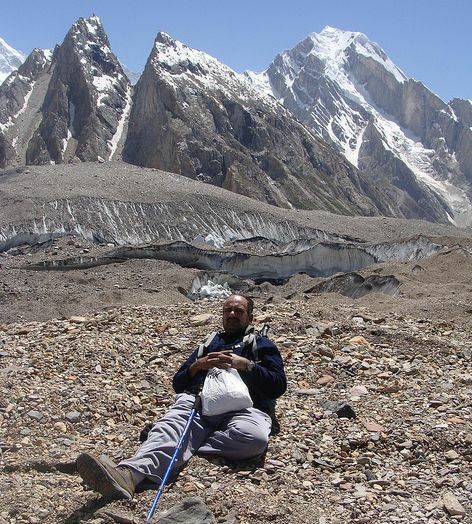 Broad Peak, 12th highest of the world at 8,047m. 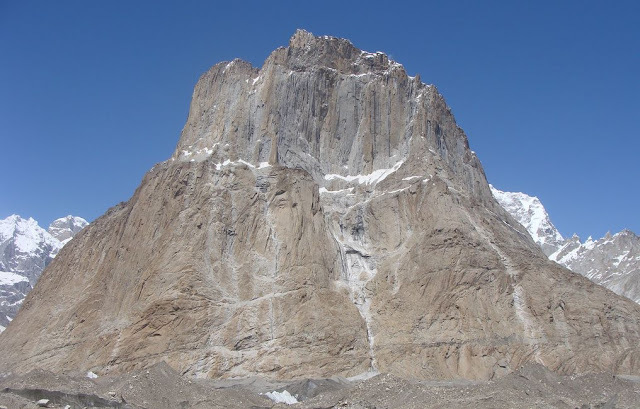 Gasherbrum II, 13th highest of the world at 8,035m. 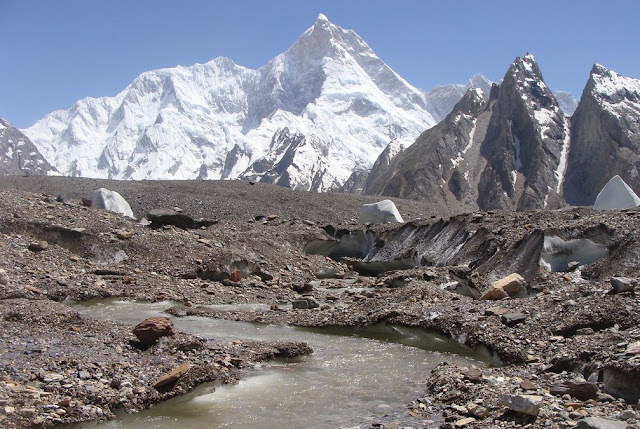 Gasherbrum IV, 17th highest of the world at 7,932m. 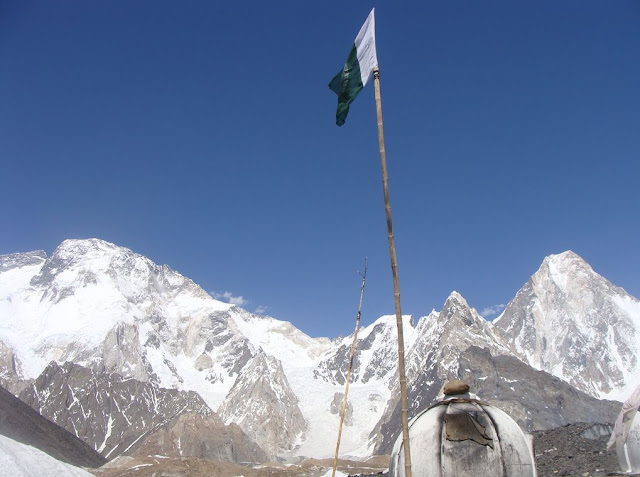 Masherbrum (K1), 22nd highest of the world at 7,821m. 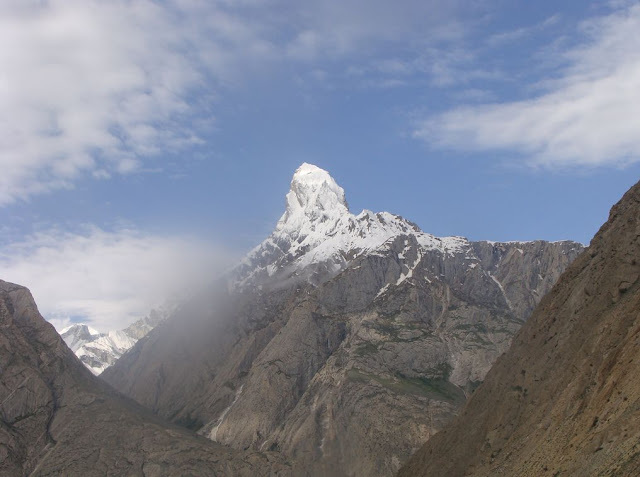 Chogolisa, 36th highest of the world at 7,665m. 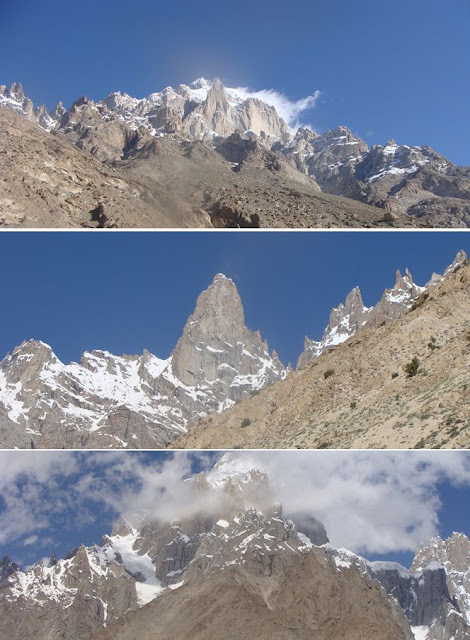 Trango Towers, 6,363m, the highest cliffs of the world. Teste after Askole is the last inhabited place one would come across. 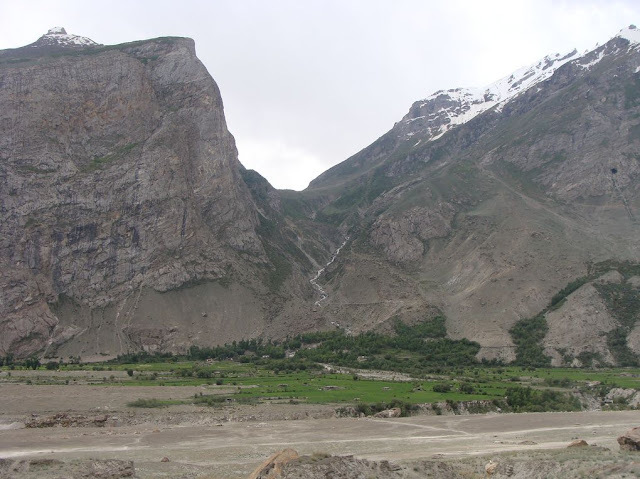 From hereon it is all wilderness, dusty tracks with distant mountains with their snow clad tops watching the trekkers as they move on. 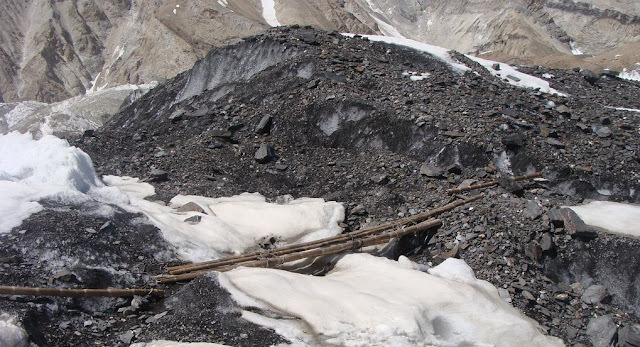 These dust tracks have supported thousands of trekkers and mountaineers going up to and beyond Concordia for the ultimate objective of scaling K-2. 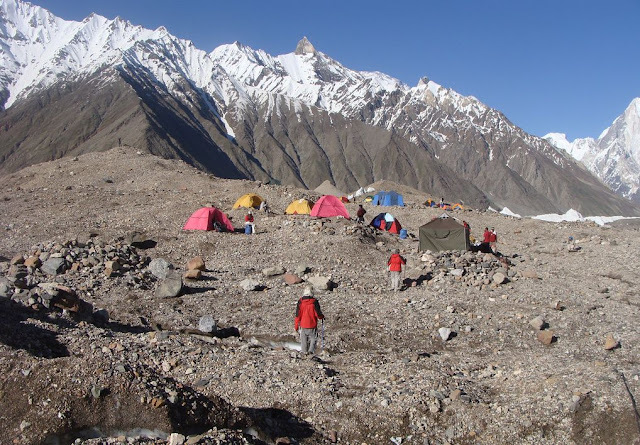 After Teste, the trekker and mountaineers have to rely on a number of campsites that come en route with scanty facilities. 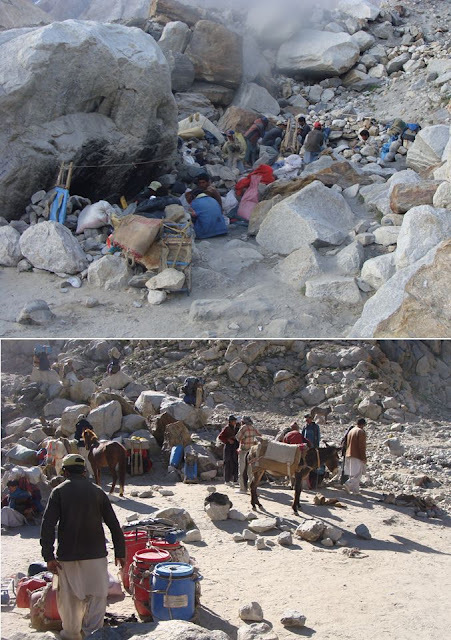 Therefore one has to be well stocked and extra luggage carried by porters on men and donkeys. 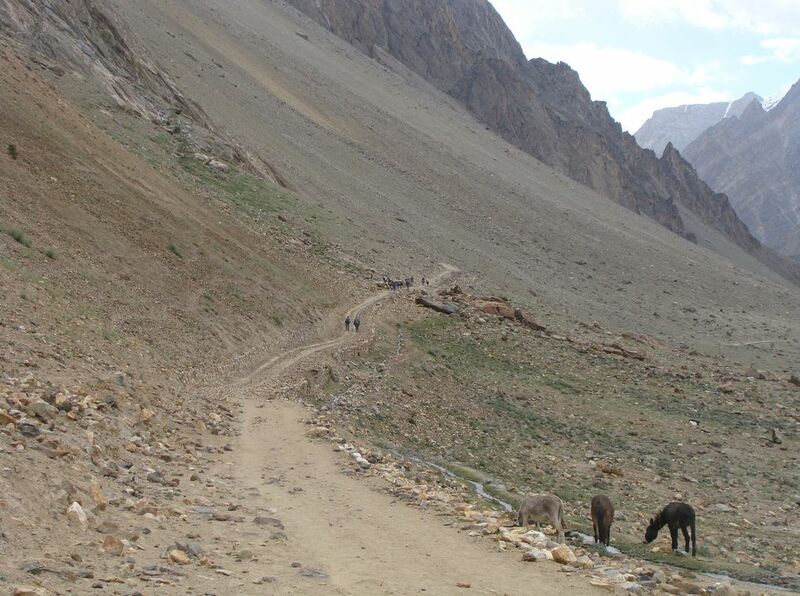 Without these porters and donkeys, no trekking or mountaineering expedition is possible. 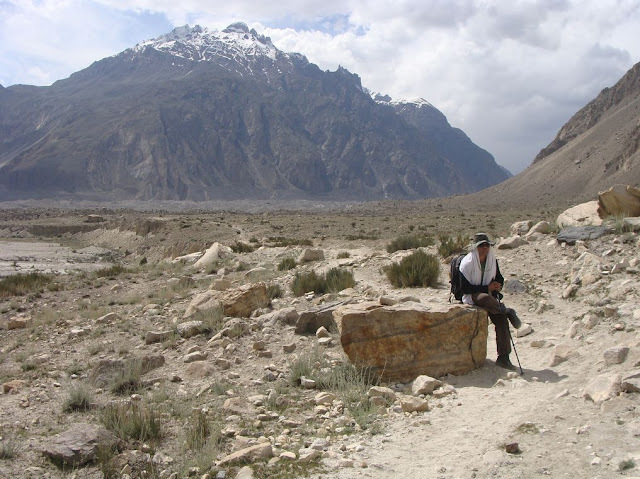 The porters, the men of the soil are sturdy, strong and simple people who support the expeditions for a very paltry amount, barely sufficient the reward of their portering facilities and the support to expeditions. 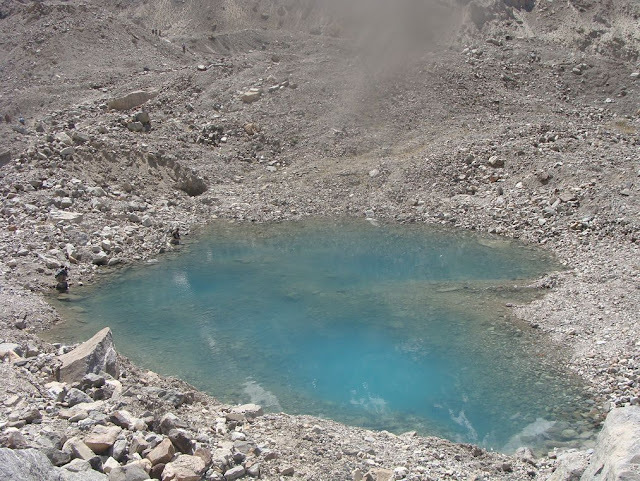 The trek from Jhula Campsite continues along the Braldu River to Paiju Campsite located at 3,480 M, a green Oasis under the shadows of Paiju Peak 6,611 M.
The Heart Lake is a beautiful heart shaped lake. 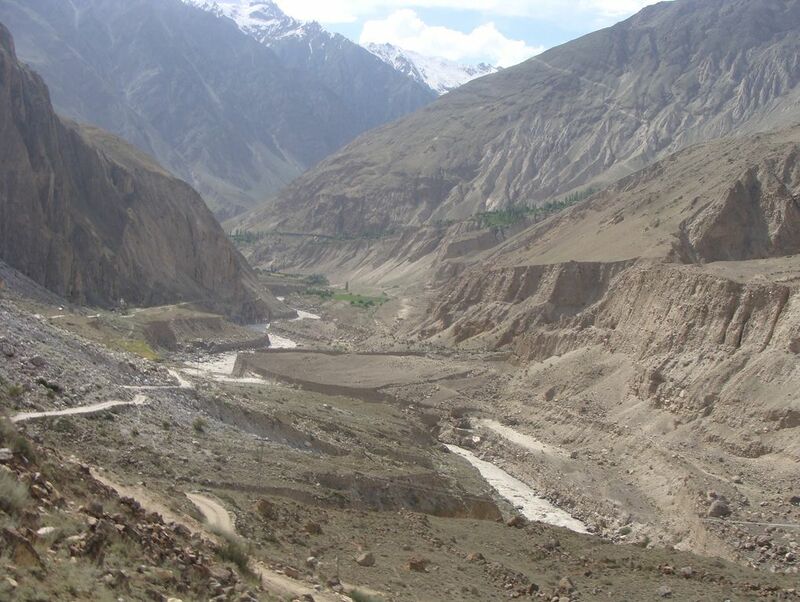 Although in the photographs, taken from a height it looks small, but if you compare the porters sitting on the left bank, one can guess how big is the lake. The name Lilligo may sound absurd and rather meaningless. But there is a local story that supports the name. Whether the story is true or otherwise, but it gives some'insight' into on possible explanation - and may be convincing. The local story is that an expedition was heading to Concordia when one of their members, Lilli, fot altitude sickness and could not go on. She decided to head back with a porter and at this spot lost her balance and fell into a crevasse. The porter ran back to the expedition and in his limited english said "Lilli go" to tell them she had fallen off, and from then on that spot is called Lilligo. I am not sure if this is true but it causes endless laughter among the porters when it is told (the story is quoted by Ashiq Iqbal). 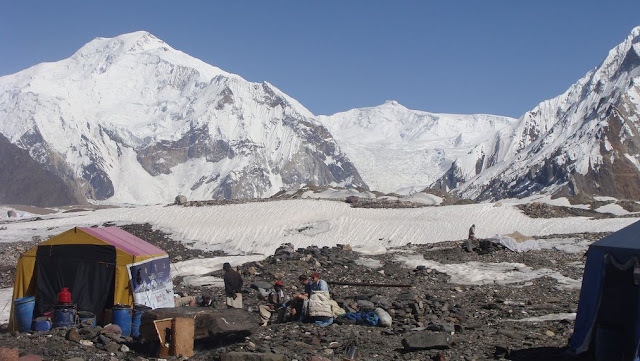 From Khurbutse, the next campsite is Urdokas, passing through crevasses and Lilligo Peak. 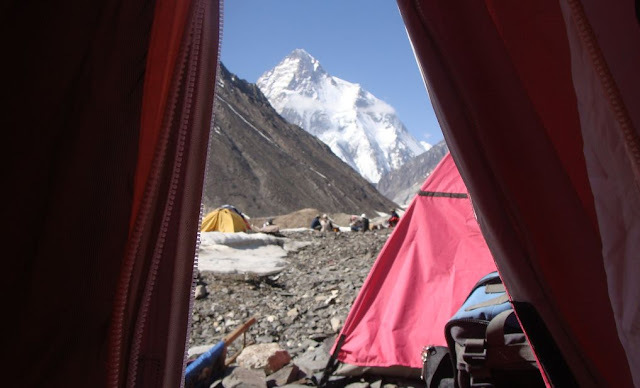 The camp is located at 4,130 M.
Masherbrum (also known as K1) is located in the Gilgit Baltistan of Pakistan. 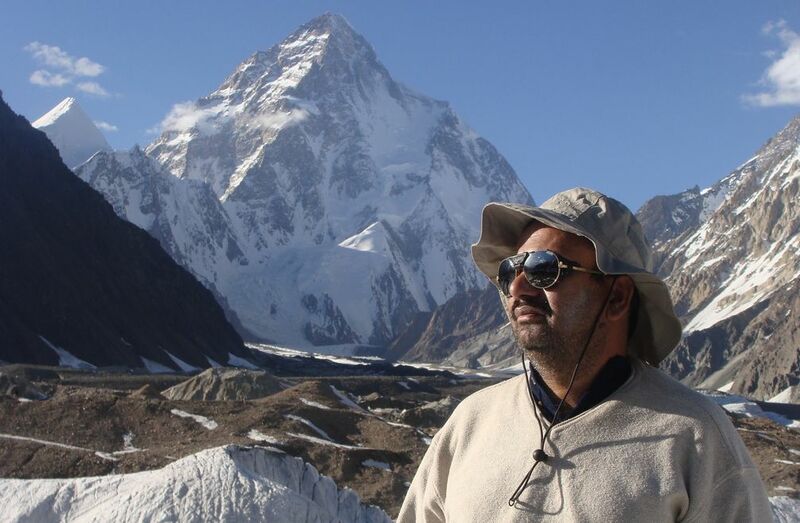 At 7,821 metres (25,659 ft) it is the 22nd highest mountain in the world and the 9th highest in Pakistan. It was the first scaled and mapped peak in the Karakoram mountain range, hence its name. 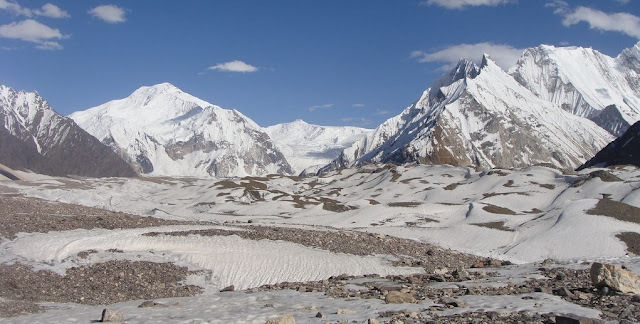 The meaning of the name "Masherbrum" is not entirely clear. It may come from mashadar (muzzle-loading gun) plus brum (mountain), from the resemblance of the double summit to an old muzzle-loader. It may also come from masha (queen or lady), giving "queen of peaks." Other meanings have also been suggested. 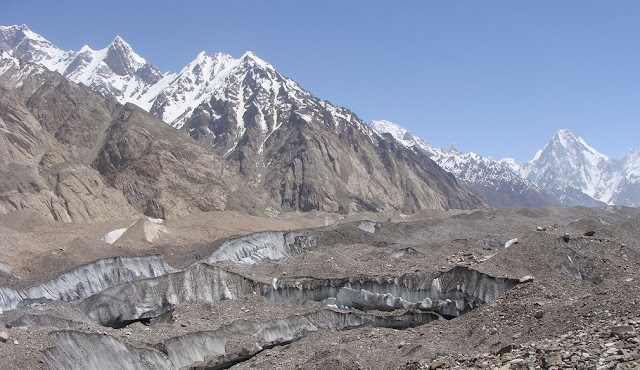 Baltoro Glacier takes the trekkers to the last campsite of Goro at an altitude of 4,500M, before reaching Concordia. 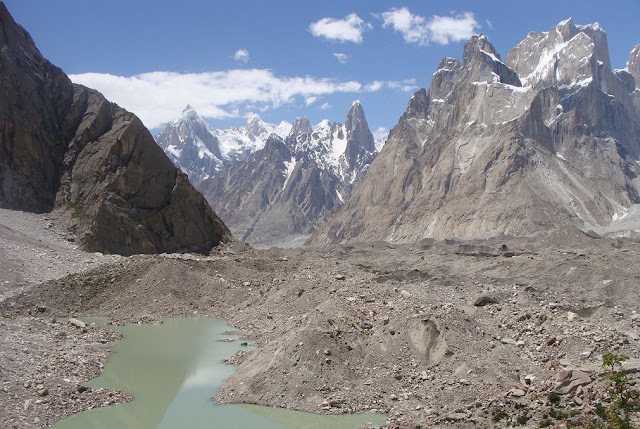 En route, one comes across the Yermanandu Glacier which flows down from Masherbrum and joins the Baltoro. 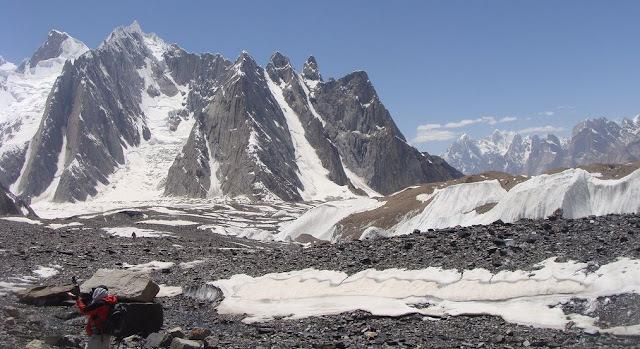 Besides one has magnificent views of Muztagh, Mitre and Gasherbrum IV. 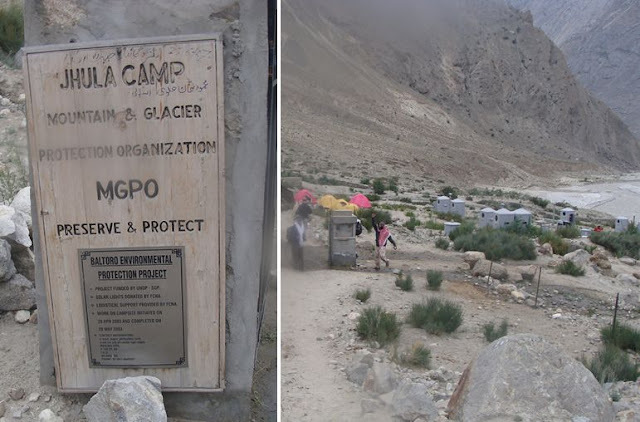 After Goro, there are no campsites, but one comes across Pakistan Army posts. 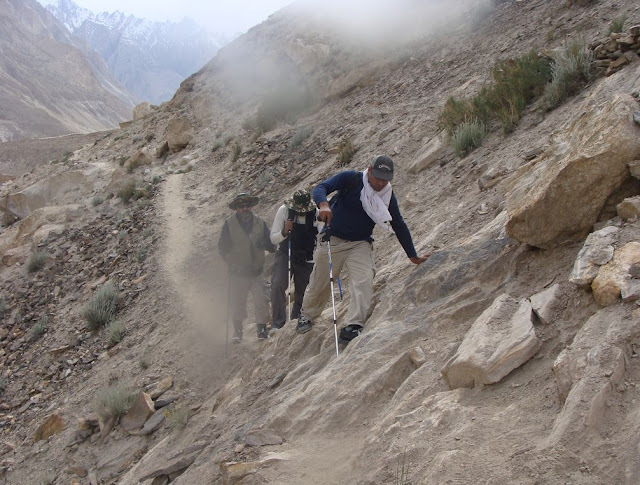 The army personnel re extremely hospitable to trekkers and expeditions and offer whatever they can. One may rest for a while on 'sofas' made of empty jerrycans with cushions placed over. 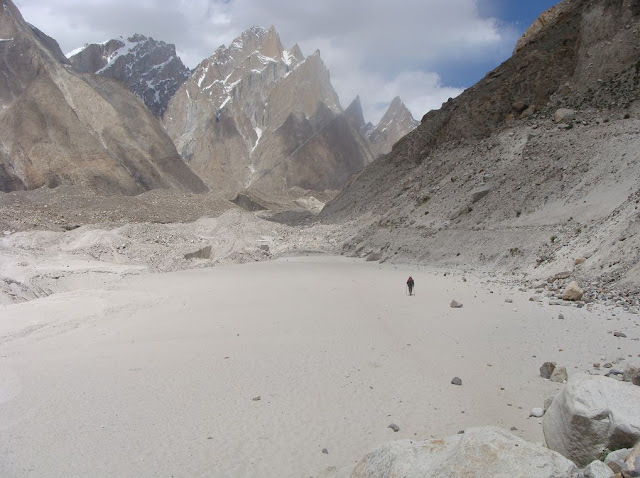 From Goro campsite, there is a long walk on the Baltoro Glacier to Concordia - junction of three glaciers: Baltoro, Abruzzi & Godwin Austin Glaciers. 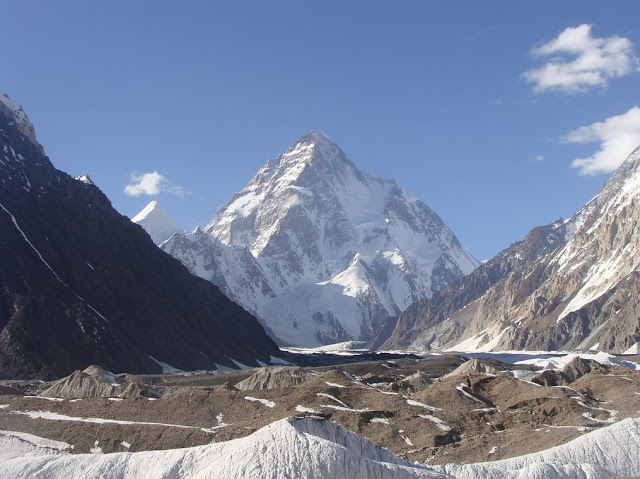 Concordia is located at an altitude of 4720 M. While approaching Concordia, one gets to see the first glimpse of massive K-2 pyramid like peak appearing from behind the mountains. From Concordia, another 4-5 hours trek leads to the base of the K-2. Form here on, it is another world for mountaineers to scale K-2. 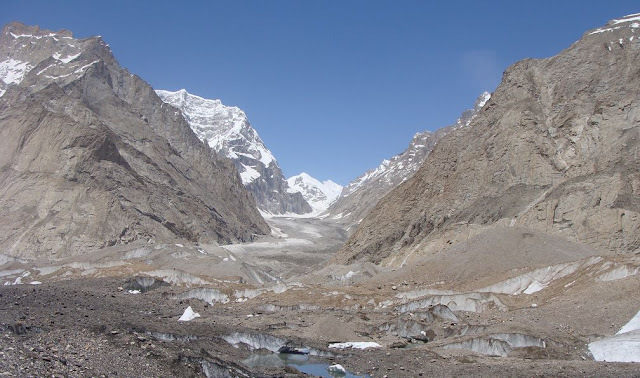 While for the trekkers, one has two options: Walk back on the same footsteps one came or choose another trek through Vigne glacier and reach Ali Camp. 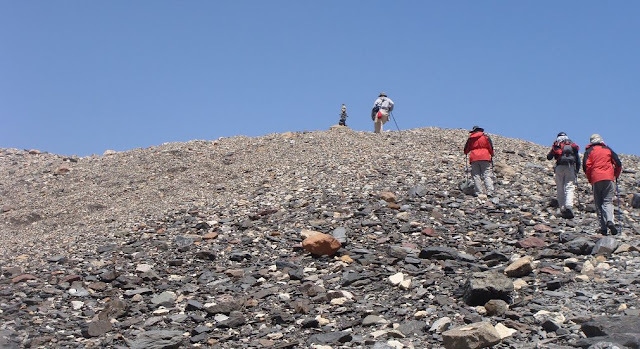 Choosing the Vigne glacier is normally the preferred option as it is fairly easy then walking on the stony trek one came on. 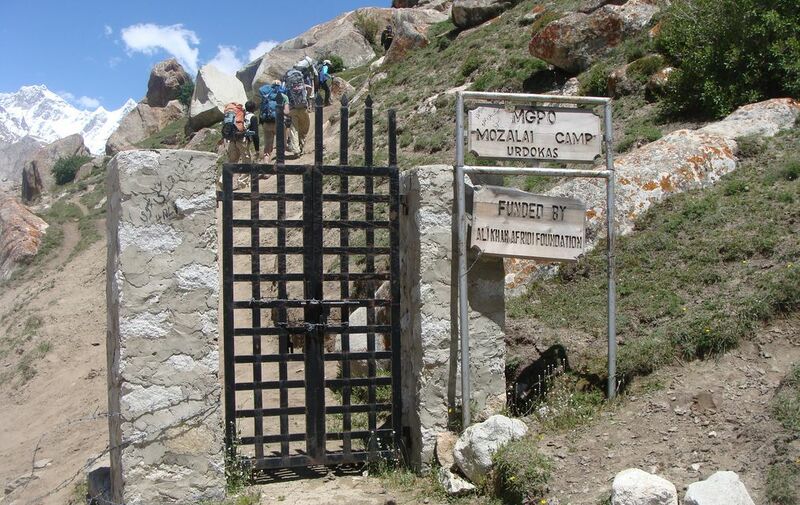 From Ali Camp, one has to cross the Gondogoro la to reach Khuspang. From here, one goes to Dalsangpa. The trek from here goes along the path down hill to the summer settlement called Shaicho, a large shepherds settlement. This would be a welcome relief as coming back to pepole and facilities like a a hotel and mountaineering equipment shop. 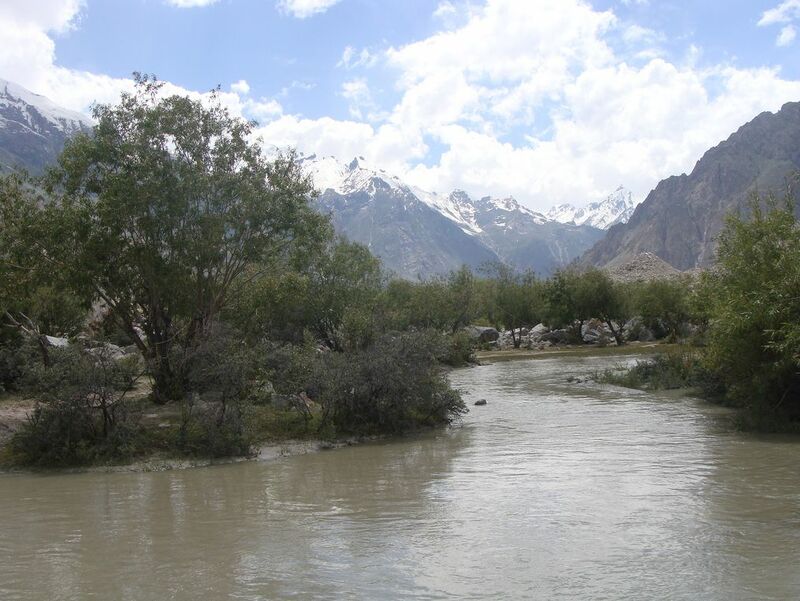 Shaicho is located among forests of juniper, cedar and willow trees with giant bushes of wild roses. 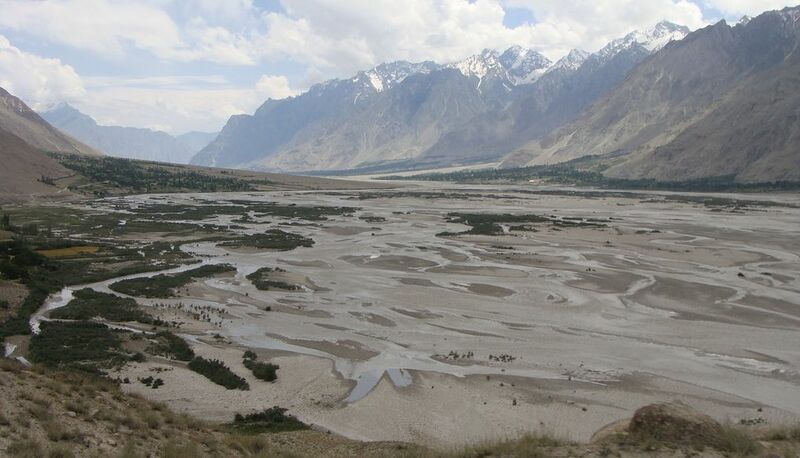 From Shaicho, the trek along Hushey River takes trekkers to Hushey village whre one finally listens to the roars of jeeps and engines once again, last heard at Askole, that take the trekkers back to Skardu. Thus the trek to Concordia comes to an end - a lifetime dream comes true and everyone goes back to life with lot of stories and memories to share with others. And also cherish the meories for the rest of one's life of a memorable trek. Thanks for the information. I will have to look into them for my own needs and check out your blog. Thanks for the purpose of delivering such superior post. a ton! daftar harga . I enjoy perusing your site. Thanks a lot! daftar harga .